one. a last minute morning meeting. the sweet spirit that carried me today. two. this husband. this home. 'nuff said. three. 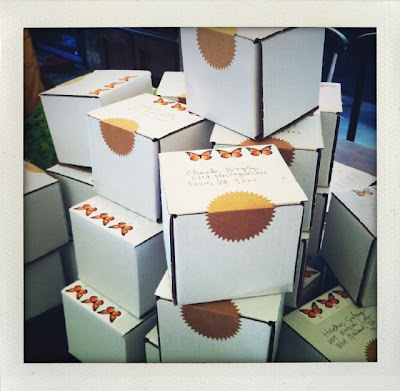 a pile of boxes with butterfly stamps - PROJECT: craft tickets. it means that we're collaborating. on something that we love - the tiniest of details. four. five months of charlie grey. and still a magic baby. five. a red plaid blanket. that i hope is cuddled up to somebody that i love tonight. there is a struggle going on over here. wanting to be best friends. when they decide that princesses and bad guys can play together. i am her. she was me. on my speakers this very moment: sweep down early - innocence mission. a lullaby for charlie grey "why won't spring come..."
when i wear this sweatshirt, i feel like my mother. i am noticing that i am becoming the her that i remember. the version of her that i grew up with. my age now is parallel to hers when i was lukey's age. which means that the me now - will be the one that he remembers. does that make any sense? because it makes perfect sense to me. there is a picture that exists of us. my mother and me. it's somewhere and i've been hunting for it for years. in it - we're scrubbing our cabbage patch dolls with a fingernail brush at the bathroom sink. she's wearing a big comfy sweatshirt. and i am making this super cheesy smile! my four almost five year old face. i clearly remember being so happy that her time was mine. we used to hunt for those dolls all over town. putting them on lay-a-way and saving our pennies. i remember play dates with the children of her friends. taco johns drive-thru treats. movie clubs. puffy paint crafts. hamburger casserole and green beans at the kitchen table. visiting my dad at work. trips to the library and getting picked up from daycare. i remember simon and garfunkel sneaking in between peter, paul and mommy, too. that is my life, now. my mother just decided on a whim to go back to school. no, really. a spur of the moment thought and the next minute she was enrolling herself on the computer. she has a backpack and professors. she has classmate friends and homework deadlines. our daily phone calls are happening between biology and anthropology. she sent me a link to her homework website the other day. her first and last name in capital letters up on the top. and it just sort of hit me. that she's not just my mother. she's cathy. she has worries and loves and dreams and children and a husband and a home to keep. a heart to nurture. a body to take care of. she's having a spin on the planet thats all her own. that she was me once. that she had these same days. maybe even these same thoughts. was she this tired, too? i imagine my life twenty five years from now. i am hoping that i am just as brave. that my fifty four looks something like big girl school, a job that fills my cup, and humanitarian trips to africa. A-F-R-I-C-A?! that my heart expands to huge for my adult children the same way that hers has. that i'll still sing ryan adams at the top of my lungs. 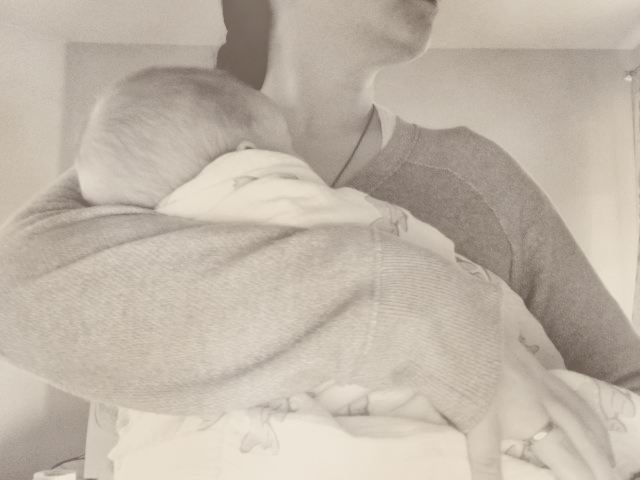 tonight i rocked and nursed my charlie-baby in my grey sweatshirt. sang him "five hundred miles" peter, paul and mary style and stuck a post-it note on his heart. a little reminder to call me everyday when he's a grown-up-charlie-man with baby boys of his own. i felt like my mother. she would have been rocking baby natalie brynn at this age. in her shiny brown rocking chair on chestnut street. in a few weeks they will brave the trip to senegal together. and i wonder if she imagined that then?